Fixed Odds Betting Terminals, or FOBT for short, are land based machines that allows you to place wagers on games that have fixed odds. 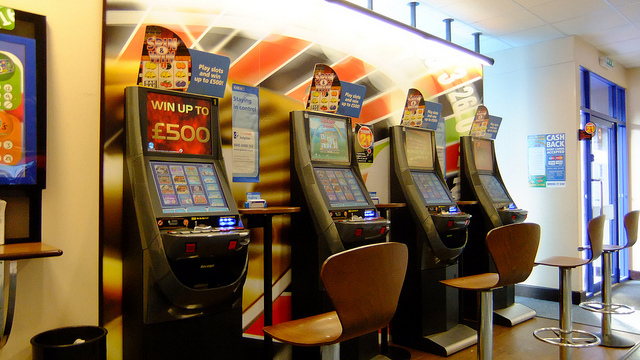 Fixed Odds Betting Terminals are primarily found throughout the UK, but they are prevalent throughout the rest of Europe as well. One of the most popular types of FOBT machines is the ItBox. The ItBox delivers fixed odds betting content to more than 3,000 licensed betting offices across the UK. To use the ItBox, users simply place bets on the different betting concepts that are available in each shop. Then, using broadband DSL, the machine generates a random number and feeds that result down a secure DSL line directly into the Fixed Odds Betting Terminal. The terminal then displays the result to the user and amends the bet accordingly. With all Fixed Odds Betting Terminals, the content is refreshed down the broadband wire while performance and maintenance data is fed up the wire in real time to the data centre and helpdesk. Another popular type of Fixed Odds Betting Terminals is the Global Draw FOBT machine. Global Draw FOBT machines outcomes are determined by a random number generator (RNG) at the manufacturer’s Bedford base. Results for each of the terminal's games are calculated every second and transmitted via satellite to the Global Draw machines around the country. When someone places a bet, the terminal takes the results from the RNG at that particular second and ignores the other results being transmitted until someone is ready to bet again. In fact, the frequency of results generated gives the impression that it is the terminals themselves that are calculating the results (although legally this would not be permitted). Theoretically, a person in a shop in Glasgow and someone in a shop in London could get the same result if they were using the same machine, playing the same game, and pressed the button at the same time. FOBT machines are quickly giving way to online alternatives that can be accessed from the comfort of your own home. For example, William Hill is a reputable gaming establishment that allows you to place wagers on a wide variety of games from your very own computer! This is even more convenient than having to visit a local shop, which is why this form of gaming is becoming more and more popular! Not only does William Hill offer added convenience, but they also offer all of their new members a chance to collect a free bonus just for signing up! So if you’re interested in placing some bets online, we encourage you to visit their website today to learn more about what they have to offer!